Hayao Miyazaki may not be directing any longer, but Studio Ghibli is still cranking out animated gems. 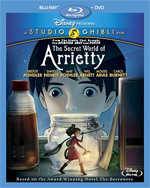 Their latest includes the name “Disney” above the name “Ghibli” but The Secret World of Arrietty definitely feels akin to My Neighbor Totoro and Kiki’s Delivery Service. Based on the novel The Borrowers by Mary Norton, The Secret World of Arrietty posits a world where three-inch-high people live under our houses where the mice might otherwise be. Arrietty (rhymes with “Fairy Betty”) is one of the three-inch “Borrowers.” She’s just turned 14, which is old enough for her to join her father on a night raid of the big people’s house. They intend to grab a sugar cube and a Kleenex, which should tide them over for a week or more. There is a new “bean” (from “human being” — i.e., a big person) in the house. Shawn (Sho in Japanese) is a sick boy who has come to the country. He sees Arrietty in the grass when he arrives, and he spots her again during her night raid with her father. He’s curious and wants to be friends, but Arrietty is suspicious and frightened. The rules of the little people are strict: once you’ve been spotted by the beans, you can’t stay; you must move somewhere else. Some of my favorite movies are Studio Ghibli titles. The ones I love best are stories where young people figure out what sort of adults to become — that’s one of my soft spots when it comes to film. In the best Ghibli films, the lush green scenery adds the emotional power of memory and place to the life-altering awakenings. The Secret World of Arrietty doesn’t rank among my favorites, although it does have gorgeous scenery — aided often by the gimmick of scale. It also has the notion of awakening into adulthood, although that theme takes a back seat to the notion of a friendship between someone who is 5 feet tall and someone else who is a fraction of that size. Still, I enjoyed The Secret World of Arrietty and would watch it again (though I admit I’d have preferred to receive the Blu-ray disc of Whisper of the Heart instead). Arrietty is a good story for youngsters for whom the world of adults is a scary place with cabinets that are too high, tools that are too heavy, and spaces that are too big. There is a fair amount of Disney marketing fluff on the disc. Trailers for upcoming discs and theatrical releases play by default, and the menu button won’t let you skip them; you need to press the chapter skip button past each one. None of the extra features caught my fancy. Original Japanese Storyboards delivers exactly what it says. The Trailers and TV Spots are all from Japan, and they are very repetitive. The American extras have to do with the music recorded for the film. Cecile Corbel sings and plays the harp. Bridgit Mendler might be familiar to Disney TV addicts, though I confess I didn’t recognize her. Neither pop song stuck with me as much as the simple themes Joe Hisaishi wrote for Ghibli in previous decades. The DVD which comes in the combo pack has the English and Japanese versions of the film, and the extra feature with Cecile Corbel. Watch the feature. Skip the extras.